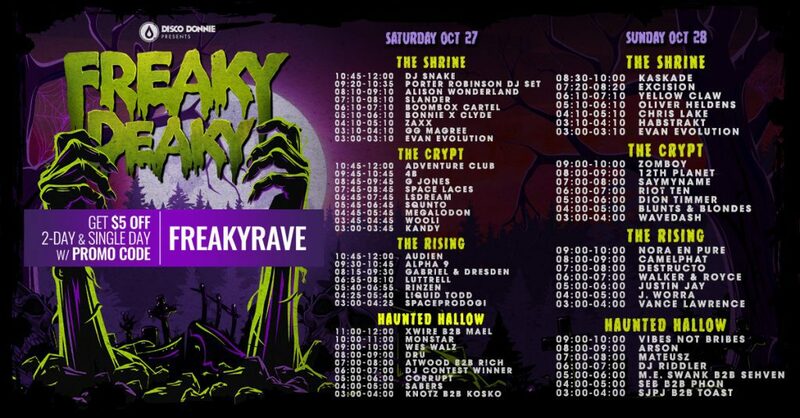 With just days to go until one of the biggest Halloween festivals in the country welcomes thousands of ravers from Texas and beyond, the Freaky Deaky 2018 set times have been released. This means that you’ll be able to see exactly when your favorite artists are playing and one which of the four stages. There’s likely to be some conflicts you’ll have to figure out and windows where you can explore and discover new acts. Now on the last tier of tickets, the event is almost sold out. With that being said, if you haven’t purchased your passes already, be sure to buy your tickets now. Save an easy and instant $5/ticket just by using the promo code, FREAKYRAVE. Learn more about how to use this promo code. Or, just click the button below. Want to type it in manually? Visit https://freakydeakytexas.com, click the Buy Tickets link, click "Have an ambassador code? ", then enter FREAKYRAVE (all caps). The Freaky Deaky 2018 set times are spread over 2 days and 4 stages. That’s an incredible amount of music to fill your Halloween weekend. The festival kicks off Saturday, October 27, at 3pm. The four stages (The Shrine, The Crypt, The Rising, and Haunted Hallow) host several acts across multiple genres. Discover new acts at the Haunted Hallow, or head over to the crypt for your share of bass. At the main stage, The Shrine, expect hours of back to back headliners dropping unforgettable sets. For the second day in a row, Freaky Deaky 2018 brings a stacked roster of acts. Enjoy face melting bass music at The Crypt or chill out to some house at The Rising. The Shrine (main stage) closes with Excision followed by Kaskade sure to leave you going home with good vibes. With the Freaky Deaky 2018 set times revealed, you can feel the hype building as the festival nears. As mentioned, there are just days before the event and tickets are almost sold out. With prices that just went up on Friday, now is the time to buy if you haven’t picked up your passes yet. 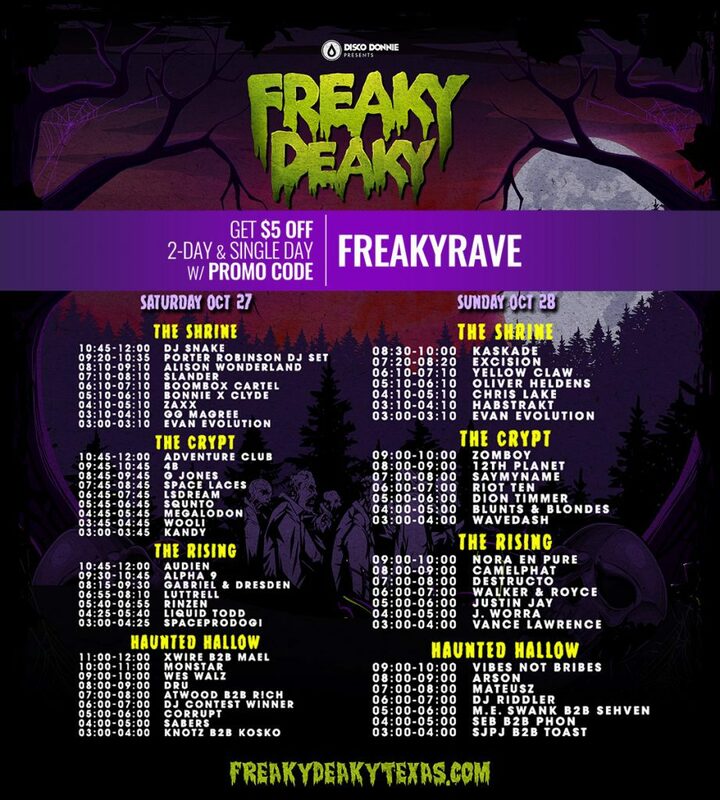 You can get an easy $5 off per ticket (GA and VIP) simply by using the promo code, FREAKYRAVE. Here’s a step-by-step on how to get this discount.